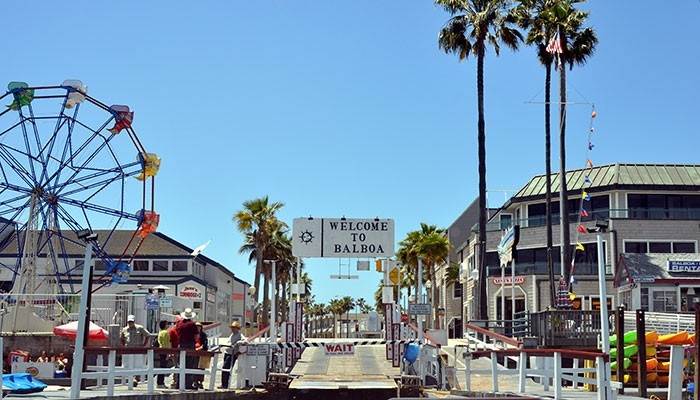 The Balboa Peninsula is located in Newport Beach, California. It is also referred to as "Balboa, California." About three miles long, it is home to some of Newport Beach's most recognizable landmarks. Traditionally, the Peninsula consists of all the contiguous land east of 45th Street. Most of the business is concentrated along Balboa Boulevard where it meets Pacific Coast Highway, McFadden Place, and Main Street. "The peninsula", as it is referred to colloquially, acts like an arm enclosing the Newport Harbor and its islands. The residential community at the very tip of the peninsula (suitable named "The Balboa Peninsula Point") is home to some of the most beautiful and expensive bay front and oceanfront homes in Newport Beach, as well as the famous surfing spot "The Wedge". Click Here for a great excerpt on the history of this area.